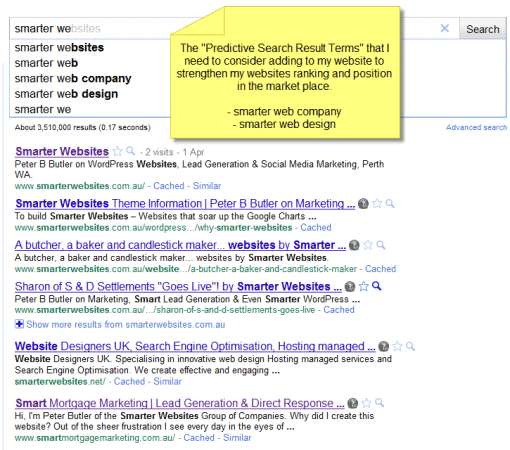 Your Website Can Benefit and Soar the Google Charts with Google’s Predictive Search Results. Google introduced this a few months ago but it is being enhanced all the time. Sorry about the lateness of getting this out but we’ve been busy getting our own and our clients sites cranking up the Google Charts. The speed increases of this feature over the last few months has been phenomenal. So why should you care at all? Apart from benefiting from faster and more intuitive search results. If you use this wisely you can use it as a tool to improve your websites search engine ranking results. If you do a search for your own website using the first primary search term you are trying to rank for, you will see what Google suggest as a predictive text. Here’s a very basic and simplistic example. If you want to strengthen your position in the market place, you need to consider adding these “predictive terms” to your website. We do recommend you do your due diligence to double check whether they are terms that have any search volume. No use trying to rank for a term no one is using. However, there is a good chance that those terms do because Google have indexed that term as being one that does have search requests attributed to it. Sometimes the terms may not have any search volume, however Google also then suggest a whole gambit of other search words and terms. And they may well be terms you never even thought of that will help your website rank better. Here’s a 7 step process. Enter one of the primary terms that brings you traffic into Google search. What comes up in the predictive text? Enter the term you’re checking. Go to the Admin area of your site. Add the term to your “SEO Tool” area (email me first if you’re a client, we’ll set up a coaching call. You do need to be careful how this is done, baby steps). It’s this constant refining that we do on our own websites and our more advanced clients websites. A word of caution! Don’t change too many things at once. Keep it simple and logical and perhaps only 1, 2 or perhaps 3 small refinements each time. Good luck and hope to see you at the top of the charts.